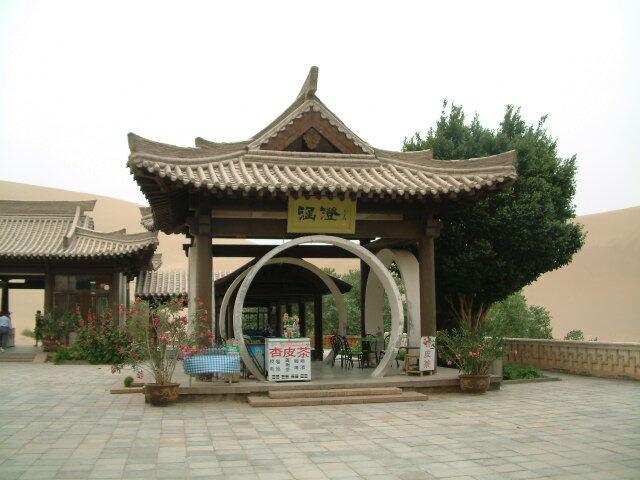 Chinese name: 鸣沙山月牙泉 (Mingshashan Yueyaquan). 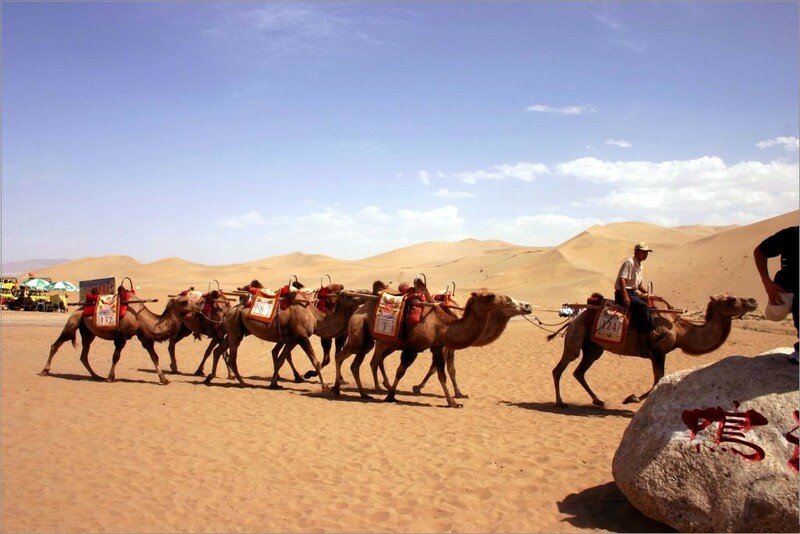 Location: at the junction of Badain Jaran Desert and Taklimakan Desert, 6 km south of Dunhuang City, Gansu Province. Ticket: CNY120 in peak seasons, CNY60 in low seasons. Opening time: approximately 08:00-17:00 (adjusted in different seasons). 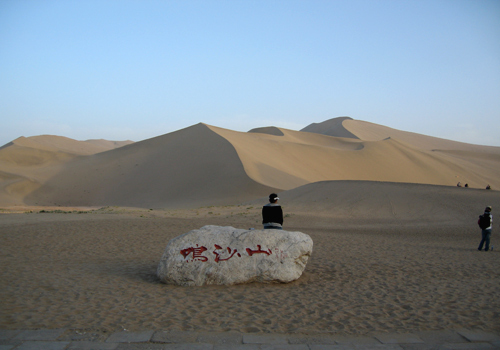 How to get there: by bus No.3 from Dunhuang. 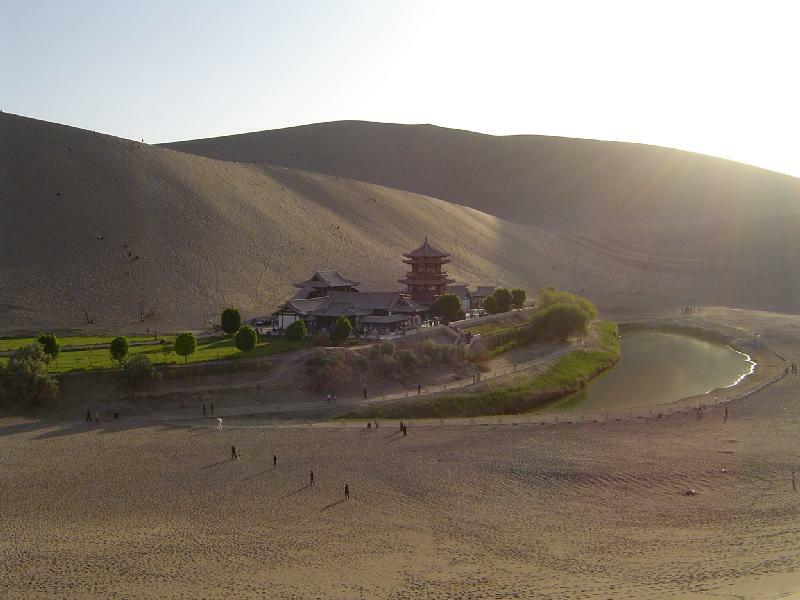 Located on the Silk Road, the Echoing-Sand Mountain is known as one of the Eight Great Landscapes of Dunhuang and one of the Four Great Singing Sands of China. 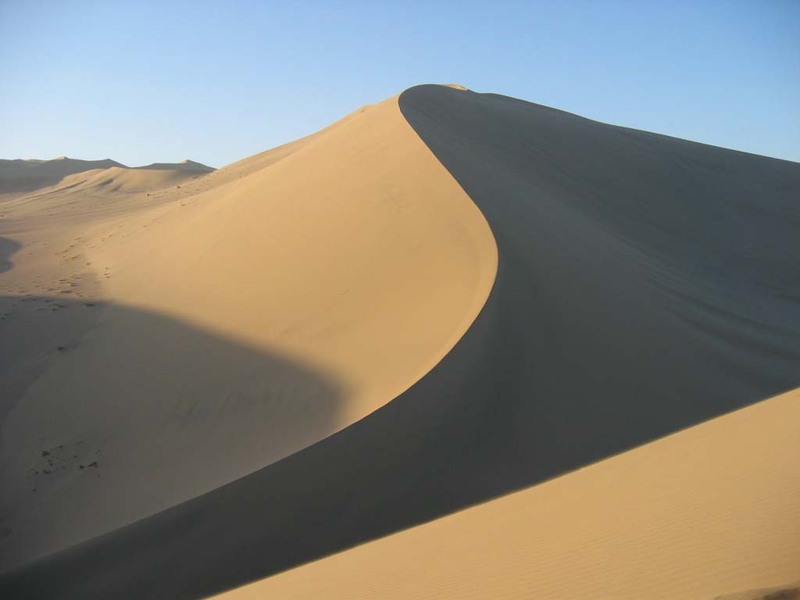 Completely piled by sands, the mountain stretches for 40 km in length and 20 km in width respectively, with the highest point reaching 250 meters. When there is wild wind, the sands will be blown up and make loud sound, while the sound sounds like being produced by some ancient musical instrument when blew by breeze, hence the name. 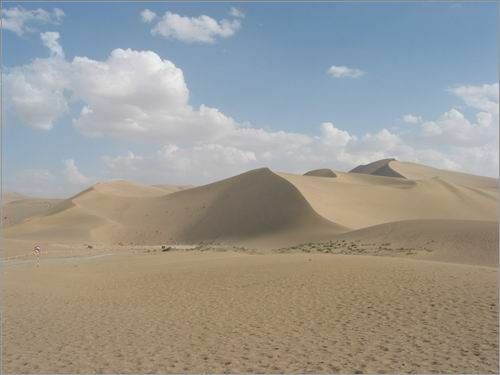 It is said that the current site where Echoing-Sand Mountain locates was once a fertile oasis in the ancient time. But weirdly, a war between two armies caused a gale one day and the armies and their war-horses were buried by sands finally, and the echoing sound from the Echoing-Sand Mountain is said to be the fighting sound of the war. However, more people would rather believe that the sound is made by static electricity, resonance, or friction between sands. 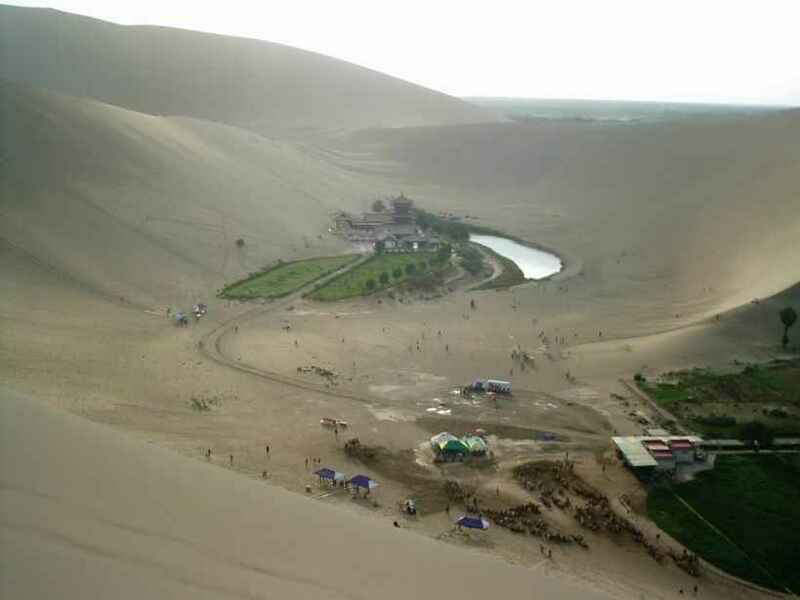 At Dragon Boat Festival in 1990, more than 200 people were divided into four groups to undertake a test by sliding down the Echoing-Sand Mountain. According to record, it was found that sounds of the four groups ranked between 54 db and 67 db, which is twice that of normal speaking volume – 30 db. 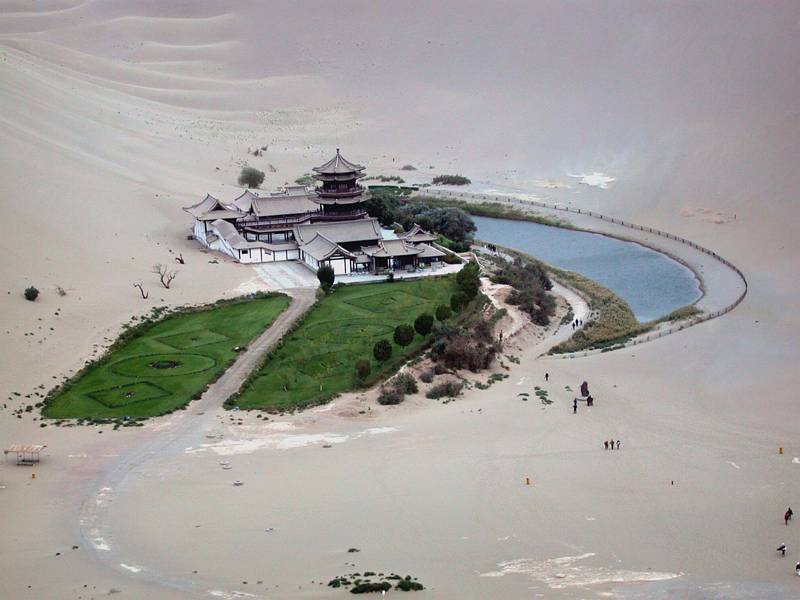 Just like its name indicates, the Crescent Lake is in a natural shape of half-moon and had been commonly considered as one of the Eight Great Landscapes of Dunhuang together with the Echoing-Sand Mountain early in Western Han Dynasty (206BC-24AD). Crescent Lake extends for nearly 100 meters from south to north and about 25 meters from east to west and has a deepest point of approximately 5 meters. Compared to its annual evaporation capacity of 2400 mm, Crescent Lake has an annual amount of precipitation of only 50 mm. 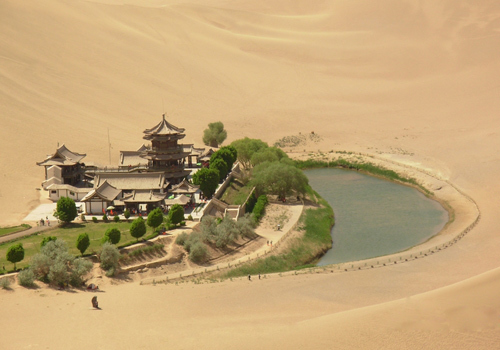 However, the particular geographic landform around it prevents it from being buried in the desert; on the other hand, the underflows beneath it also ensure continuous source for it. Therefore, the stream has never dried up or buried by drifting sands in spite of locating among sand dunes, accurately at the foot of Echoing-Sand Mountain. Iron back fish, five-colored sands and seven stars grass are said to be the "three treasures" of Crescent Lake and it is said that one can live eternally if he eats the fish and the grass together. Nobody knows exactly whether they exist or not, but indeed, there are some traditional Chinese medicinal plants growing by the lake, e.g. medlars and apocynum venetum, which accompany the lake day and night with traditional Chinese buildings.